Data Management With INCS Ensures Protection. Your data lives on your servers, your desktop, your laptop, your tablet, your phone, and in the cloud. What if you accidentally delete an important file or it somehow gets corrupted? Certainly not the least of these concerns is how quickly your quantity of files and emails can grow over the years. Its human nature to hoard our data which can become quite costly. Not only are you paying employees to create it, but you’re paying to store it, you’re paying to back it up and you’re paying to secure it – likely in more than one location. All of this can be quite vexing, but it doesn’t have to be. 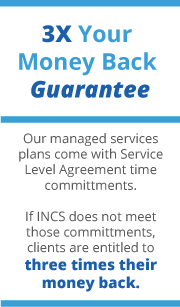 At INCS we help our clients with all of dat(a) by protecting it from prying eyes, keeping it manageable and keeping it accessible … from almost anywhere.